The Sternum FlipClip is a compact, lightweight sternum system featuring a whistle and resulting in an innovative solution to sternum buckle applications. 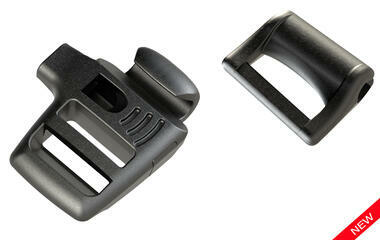 The FlipClip attaches and detaches at a precise angle that safeguards against accidental release. Attachment occurs using a hook and over-center registration onto a piping mounted slider on the shoulder strap. To detach, user ‘flips’ the part back over-center for immediate release. Ladderloc adjustment and whistle function combine into a single attachment unit eliminating the female component of a traditional system. The resultant bulk, material and complexity of construction reductions offer cost savings over traditional methodology. Designed for customizable fit on the fly, the FlipClip is fully adjustable up and down the shoulder straps utilizing the piping-mounted slider(s).